What did the queens really think, behind the façades of silk and velvet? What kind of music was playing at the masked ball when King Gustav III was shot? 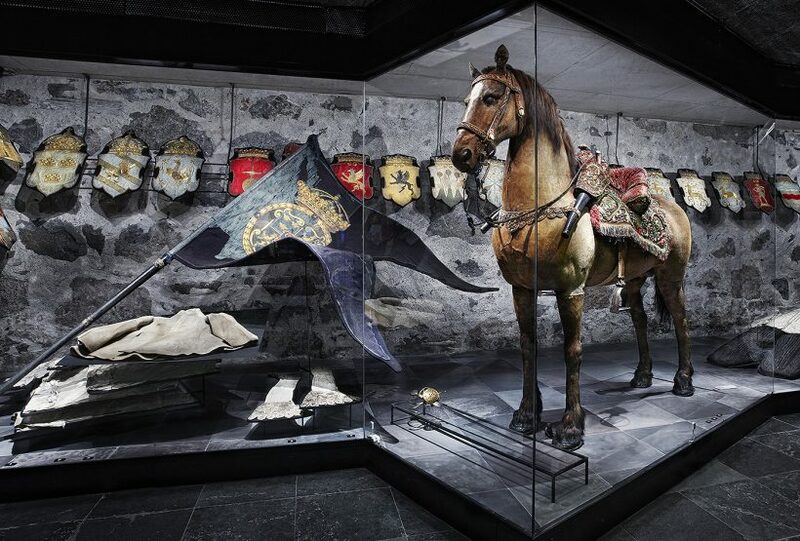 The Royal Armoury relates Sweden’s history as it really happened! As a show of strength, in 1620 Gustav II Adolf decided to build a monument to himself. And so he put his blood-stained uniforms on display – he had survived many bullets in the heat of battle. This then went on to become the museum as we see it today. The modern Royal Armoury presents his war horse Streiff and displays the uniform he was wearing when he was fatally wounded in Lützen on 6 November 1632. However, there is much more to the museum than that, including Queen Sofia Magdalena’s wedding dress in silver brocade from 1766. The phrase “royal armoury” originally meant the weapons store of the Swedish kings. Today the Royal Armoury is a national museum where you’ll find beautiful ceremonial armour, magnificent weaponry and costumes – priceless artefacts every one of them. Parts of the museum will be closed during 2018. Welcome to enjoy the royal coaches and the exhibition I love you madly. A new permanent exhibition will open in 2019. Become a sponsor – of the museums in general or of a specific project. Contact us for more ideas.